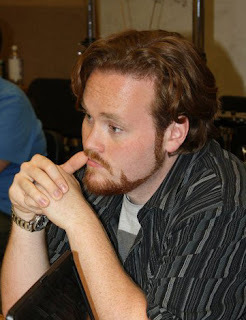 Today's post is by Dan Miller, Seattle Opera's Artistic Administration Intern. As a lifelong devotee of opera, I am absolutely thrilled to be working on the Young Artists Program's current production of Don Pasquale. I was hired on as the Production Assistant and the Titles Editor, but my relationship with Seattle Opera goes back to when I was four years old and I saw my first Ring cycle in 1991. I have since seen, with avid devotion, every single opera Seattle Opera has produced. I first worked with Seattle Opera in 2005 as an Education Intern for the second full presentation of the Wadsworth/Lynch Ring cycle, running titles for chorus rehearsals and assisting lectures. I started working last September as the Artistic Administration Intern, helping with season planning, contract drafting, and various aspects of the prodigious amount of work that goes into operating the Young Artists Program, both on the administration and production sides. 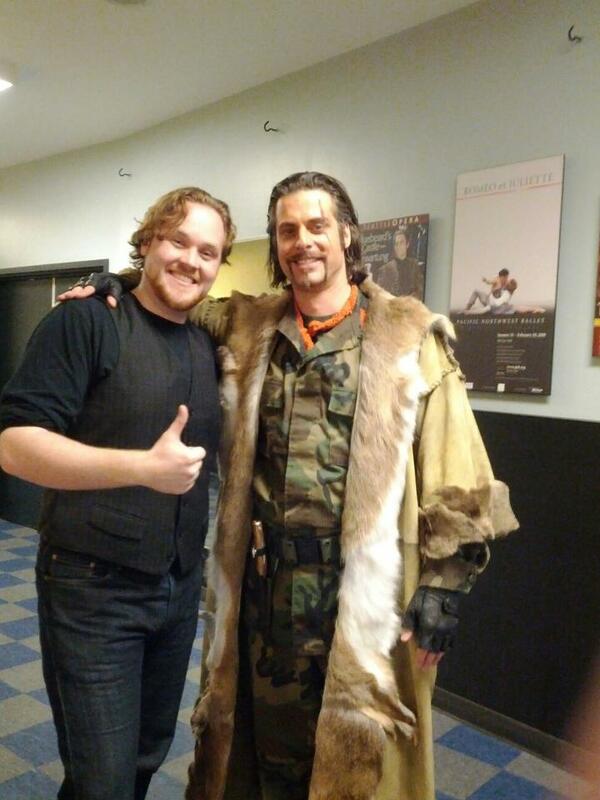 Dan Miller backstage with John Relyea at a performance of Attila. I came to these positions from the University of Washington, where I studied Music History and Cinema Studies, with a focus on opera. Imagine my elation, then, when I realized that this year's YAP spring production would take place not in the Meydenbauer Center Theater, as it has done in the past, but in Meany Hall, where I have had experience as a Stage Manager and Assistant Director with the UW's opera program. Dan Miller directing a rehearsal of Dido and Aeneas for UW opera. The YAP coming to Meany Hall represents a significant opportunity for the University of Washington's School of Music. Seattle Opera gives its YAP productions every bit as much attention and effort as the mainstage shows presented in McCaw Hall, and here that astounding professionalism makes the journey to the Univeristy of Washington campus. Having an A-level opera company within sight of the School of Music gives students a look into the word of professionally run opera, which is very different from collegiate opera programs. "Tech week" is the very busy last week of rehearsals where the show moves from the rehearsal space to the theater and the lighting design is done. With Seattle Opera, due to the sheer amount of people working (from Hair and Makeup, Props, Carpenters, Stage Management and right down to singers, designers, and many others), these rehearsals run like clockwork, with very little deviation from the schedule. Thanks to a collaboration with the UW School of Music, some students get to experience this first hand. 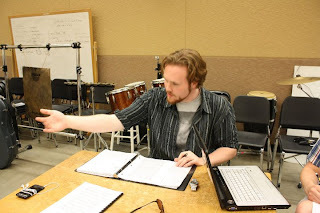 I believe that some in the YAP orchestra are affiliated with UW, and Kenny Enlow, who sings the Notary, is a Master’s student with the UW Opera program. 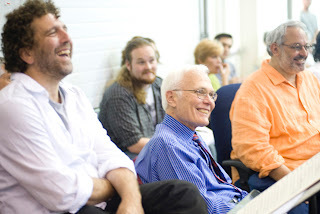 Observing a Seattle Opera rehearsal of Tristan und Isolde in July, 2010: Maestro Asher Fisch, Intern Dan Miller, General Director Speight Jenkins, and Stage Director Peter Kazaras. Having grown up with a company world-renowned and critically acclaimed for championing the works of Richard Wagner, it's only natural that I became a rabid Wagnerian. One would be very hard pressed to find an opera as starkly different to the Wagnerian Gesamtkunstwerk as Don Pasquale. I am an infant opera director with a couple of scenes with the UW Opera Workshop under my belt as well as a couple of productions with my own small company, Vespertine Opera Theater, and I tend to gravitate toward works with stark, existential narratives and plenty of pathos...you know, the kind where most of the characters die at the end. The YAP gives young professional singers an invaluable training experience, but it has also given me the learning experience of a lifetime watching Artistic Director Peter Kazaras at work. Peter is a master of all styles, from Wagnerian tragedy to ebullient Italian comedy. I had the pleasure of shadowing Peter when he directed Seattle Opera's grippingly existential production of Wagner's Tristan und Isolde in the summer of 2010. There he conveyed the eternal pain of the tragically doomed lovers, and here in Don Pasquale he uses the same energy and ingenuity to present the gleefully ludicrous torment of the poor old Don. Having the YAP so close to my old academic stomping grounds is a truly fabulous thing. It’s not every day that students have such immediate access to world class direction, design, and performance. I hope this is a collaboration that will only become more and more fruitful as the years progress. Nice article. You saw the Ring Cycle at four years old? Awesome. My daughter would love to make some of those cute little dogs.